He proposes paying for Wall Street’s repeated failed bets off the backs of working class retirees. That’s right, he wants to transfer hundreds of billions from the bank accounts of retirees directly to Wall Street’s balance sheets each year for the next seven years. What would happen to that politician if he made such a proposal? Tarred and feathered? Tied to a chair and forced to listen to an endless loop of Hillary Clinton cackling? Most would say that plan is so outrageous that no one would have the balls or stupidity to ever propose it. So why the hell have we let the Fed get away with implementing it for the past seven years? Someone who’s done everything in his power to stop this massive wealth transfer by the Fed is David Stockman. He’s a former congressman, director of the Office of Management and Budget under President Reagan, and 20-year Wall Street veteran. For years, Stockman has been railing against the Federal Reserve’s zero interest rate policy because it’s transferred trillions of dollars from Main Street to Wall Street. Stockman refers to it as as “a jihad against savers and retirees.” And it’s a topic he spoke about in detail as a guest on my Trend Following Radio program. We now have an entire generation of retirees who tried to do the right thing during their working lives. They scrimped and saved to accumulate a nice nest egg so their golden years would be a little more golden. Historically, these folks could park their savings in FDIC-insured CDs or low-risk bonds and get their 5% income return each year. But the Fed has screwed them by setting and keeping rates at zero. Mom and pop investors have been stripped of tens of thousands of dollars of income each and every year that they’ve relied on to pay for necessities like food, gas and housing. We’ve allowed the Fed to basically run a gigantic fiscal policy. Namely, that zero interest rates are generating a $250 billion annual transfer of income from savers and deposit holders to the banks to repair their profitability and their balance sheets. Well, that is one utterly inappropriate and I would say even despicable way to fix the banking system. With zero rates, Yellen and Co. have stolen their traditional source of income to pay for the big banks’ reckless behavior. 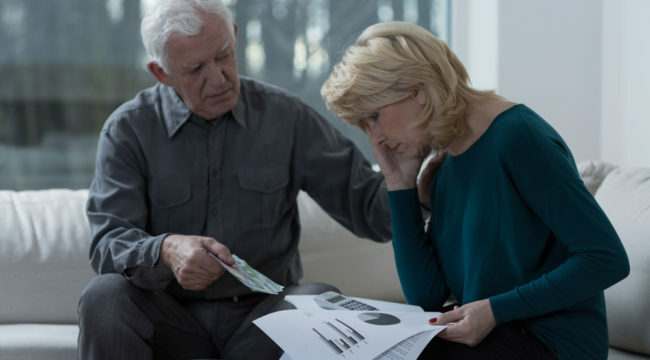 Retirees are now forced to spend down their principle to survive. Or they can take their chances in a nosebleed stock market in a desperate search for yield. The gamblers are buying stocks and funding their positions with the Fed’s zero cost money. It has turned Wall Street into a gambling casino. It’s distorting pricing and what I call price discovery. Honest price discovery based on the real world, not the artificial world created by the Fed. This is the same Wall Street casino that’s seen two massive Fed-induced crashes in the last 15 years. It’s no wonder why retirees don’t trust the stock market. But the Fed has given them no other option. They must choose between eating cat food and spinning the roulette wheel with their retirement savings. The Retiree Revolt of 2016? Where’s the outrage? Why haven’t tens of millions of retirees taken to the streets with pitchforks to demand a change in this destructive Fed policy? That’s easy. Stocks are at all-time highs. Retirees think the Fed is in control. Yellen has given them a bull market to offset their devastating loss in interest income. But things will get really interesting when the bargain falls apart during the next crash… when retirees are left with no retirement income and 50% losses in their stock portfolios. The Fed can generate massive bubbles and it can delude people into thinking it knows what it’s doing… Well, the problem with that is it seems to work for two, three, four, five years running, maybe even in seven-year cycles. That’s what happened from 1994 to 2000 and then the whole dotcom thing burst. Then we had another seven-year run and another huge markdown [in 2008]. And we’re about ready to have another reset. My question is, when that reset happens, will people finally take to the streets? Is 2016 the year of the retiree revolt? Forget Occupy Wall Street, this will be Occupy the Fed. And if it is, Stockman and I will be cheering them on. Please send me your comments to coveluncensored@agorafinancial.com. Let me know how that you think about today’s issue.